Blog tentang pengalaman penulis dalam segala hal, terutama psikologi, tips dan cara, teknologi laptop/komputer, panduan blogger, travelling, dan review. What are 'heads' in syntax? determine the word class of the entire phrase. The word class of the head in "The white _ with a stripy tail determines and gives the name to the whole group of words. Heads dominate the words they are head of: they determine many of the grammatical properties of the phrase. For example, heads provide slots for the words they enter into morpho-syntactic relations with (with in; and they frequently specify the grammatical properties required of the elements they select, i.e. their dependents. For example, because sparrows is plural, those is plural, too. Heads thus often require their dependents to agree with some or all of their grammatical features, overtly or covertly. Whether the agreement is explicitly morphologically marked or not largely depends on how much agreement morphology a given language has. English has little, so we only get the two types of overt agreement discussed in the previous chapter: the agreement in number between the determiner and the noun already illustrated with those sparrows, and agreement in person and number between the subject and present-tense verbs, as in Herry pounces. Heads also largely determine the relation between the phrase they are head of, and the 'world' beyond the phrase, i.e. the sentence they are embedded in. In other words, heads determine the external relations a phrase can enter into: for example, with determines that a stripy tail can occur with cat, as in ... cat with a stripy tail. Heads do for phrases what periscopes do for submarines: they keep contract with the outside world. Despite their importance, the concept of head is quite controversial in syntax. We know that heads exist, but there is still debate on whether all phrases have heads, whether all heads behave in the same way, and whether heads are always necessary. 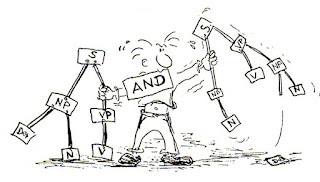 Let's look at some examples of head-dependent relationships. 0 Response to "What are 'heads' in syntax?"